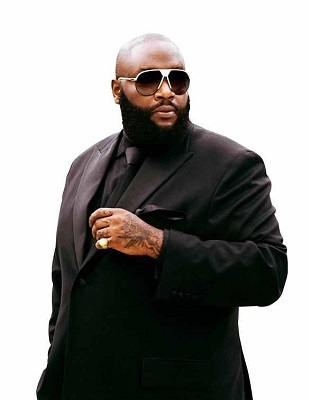 Our website provides the agent, manager, and publicist contact details for Rick Ross. Whether you are looking to get in touch with Rick Ross's agent for an event, or Rick Ross management for an endorsement, we can provide you the best and most accurate contacts. If you have any questions on how to use our service, you can contact: support@bookingagentinfo.com. Book Rick Ross. Rick Ross email, contact Rick Ross management, Rick Ross manager for business, bookings, pricing, hire. Rick Ross, born William Leonard Roberts II on January the 2nd, 1976 is an American rapper and entrepreneur. With a career that began in 2000 his debut album Port of Miami was labelled the summers hottest rap record and peaked at number one within the US and his second album Trilla also had the same success. Going on to found the record label Maybach Music Group, he utilized the label to release his next albums, including Deeper Than Rap, Teflon Don and more recently Rather You Then Me, releasing in 2017. He has so far been nominated for four Grammy Awards, most recently for his song Purple Lamborghini, which features Skrillex and his hit New Flame which featured Chris Brown & Usher. How can I book Rick Ross? You can hire and book Rick Ross by contacting the official agent of Rick Ross. Rick Ross agent will be able to provide you with availability and pricing. You can get the contact details for Rick Ross agent in our database. You will want to get in touch with the press team of Rick Ross. Contact Rick Ross’s publicist to inquire about any media inquiries. You can get the contact details for Rick Ross press team at Booking Agent Info. How can I contact Rick Ross management? The contact details for Rick Ross management can be found here at Booking Agent Info. You can get access to all of Rick Ross contacts by signing up and becoming a member. What is the Rick Ross booking fee? You can get the fee to book Rick Ross for an event, endorsement, or any type of business engagement through Rick Ross's agent. Booking Agent Info provides booking price estimates, but you would contact the agent to get official pricing. ..with the contact information for Rick Ross agent, manager, and publicist. Our site is meant to assist you in finding how much does it cost to book Rick Ross for an event, and how to book Rick Ross. Our database can be used to assist you in getting Rick Ross endorsements, interviewing Rick Ross, or to hire Rick Ross for an event.